Google updated the Android distribution numbers today for the month of April, showing a rise in Nougat to almost 5% of the pie (4.9% to be exact). That’s a decent sized jump after last month’s increase to 2.8%. In the grand scheme of things, knowing that Nougat has been out for seven or so months, 5% is pretty weak. 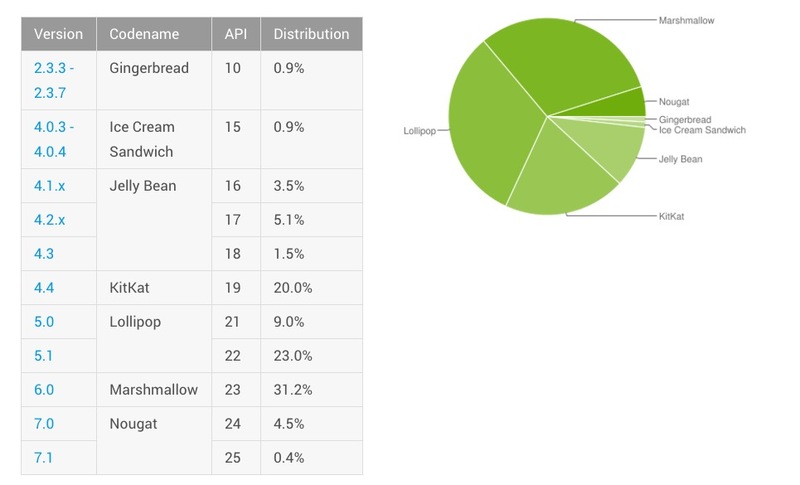 As for the rest of the numbers, Marshmallow dipped to 31.2% (31.3%), just like Lollipop (32.0%), KitKat (20.0%), Jelly Bean (10.1%), Ice Cream Sandwich (0.9%) and Gingerbread (0.9%). Marshmallow and Lollipop are still king, as Nougat is on the rise. Did we mention Android O already being in preview? Ugh. Last month’s numbers can be found here.